Sometimes it is required to find out current API version of your Org (Sandbox/Dev Org/Production) in order to perform some operations like making HTTP request to SFDC URI which contains api version. As of now, I was not able to find any method in apex through which I can get my org current api version So I have created utility class which uses Tooling API to get all version related to org and returning latest/current api version like 39.0,40.0 etc. Below is complete code for this. You can run below scripts in developer console to get current API version after saving above class in your org. After running you may get "Unauthorized endpoint url". Just add your SFDC base URL in remote site setting to avoid this exception. Looking forward for your comments and suggestions..
Salesforce provide an option to include lightning components in VF page by adding it to Lightning app and referencing that in VF page. In this blog, I am going to show an example to fire lightning events from VF page. here I will be passing account billing country from VF page by firing component event and displaying its value in component through event handler. Below is complete code for firing event from VF page. Below code also contain sample code to pass component attribute value from VF page. Looking forward for everyone's comment and suggestions..
As we know that we can include Lightning component in VF page by creating a Lightning App and add it to VF page by specify particular script. Sometime it is required to pass some dynamic value to component so that it can behave differently based on component attribute value. Below is sample code which explains how to passed component attribute from VF page. Here we are passing Account name to lightning component by using standard controller on VF page. where xxxxxxxxx is Account Id. Whenever you use extends="ltng:outApp" in Lightning app, SLDS is automatically get applied your components. If you don't want to apply SLDS, just use extends="ltng:outAppUnstyled"
If you are having org namespace, then always use " <namespace>:lightningComponentName" instead of "c:lightningComponentName" in VF page. We have created a lightning component which can be used to display Loading Spinner image whenever you perform any server side (apex method call) or some complex operation on client side (component controller). Create a attribute in your component of boolean type to show and hide spinner. Add below component reference in your mark up. Here showSpinnerCmp is component name. In your controller just toggle the showSpinner value to true/false to display/hide spinner. You can find complete code for showSpinnerCmp component below. You can now save this component and can used with any other component. Sometimes it is required to display set of records in Lightning component with different features like sort, search and pagination. In order to perform this operation every time with help of server side controller is not advisable approach specially for lightning experience. 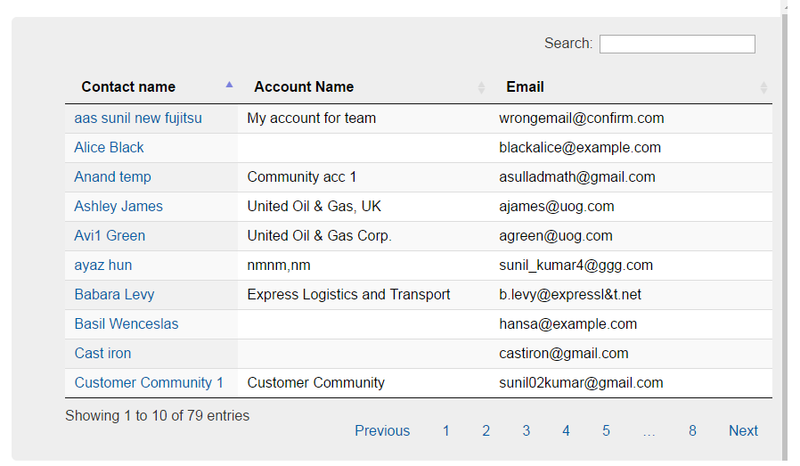 I have created Lightning datatable component which can display records from any sobject. 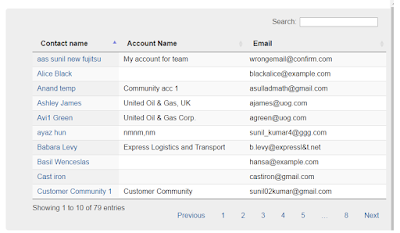 You need to specify below mention component attributes and it will display record in datatable with all features. columnsLabelList="Contact name, Account Name, Email"